Divine Mercy Sunday is celebrated the second Sunday of Easter, but for many parishes in the U.S. bearing the name Divine Mercy, the message of God’s healing mercy is one heard throughout the year. As the popularity of the day has grown, more churches are using the day to remind parishioners about the power of mercy, confession and forgiveness. At Divine Mercy Parish in Vineland, New Jersey, the feast is an opportunity to draw parishioners closer together. The church, which draws predominantly from Puerto Rican, Mexican and Dominican communities, is planning a bilingual event that includes a procession and Mass, followed by prayer of the divine mercy chaplet and a speaker offering ways to share God’s mercy with others, said Sister Mary Lou Cardenas, a Missionary Daughter of the Most Pure Virgin Mary, who is organizing the day’s festivities. “I tell them this is not a celebration of one day. This is a celebration of the entire parish,” Sister Cardenas said. Sister Cardenas said for the last two years there has been an active group of parishioners with an ongoing devotion to their namesake. 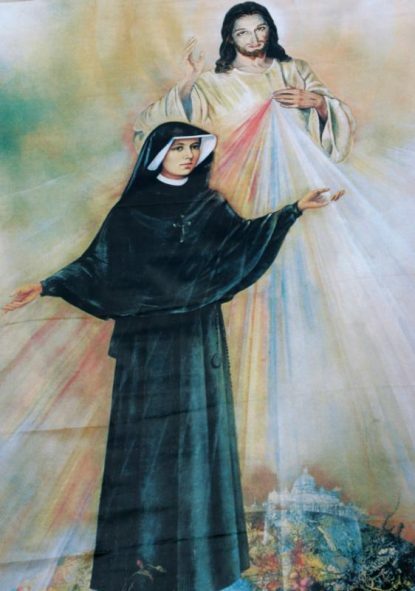 Nearly 100 families have taken turns bringing the divine mercy image — an image of Jesus with red and white rays extending from his heart — into their home for a weeklong devotion and prayer of the chaplet. “It spreads our message of mercy, which is for us all,” Sister Cardenas said. It’s not one day but a weekend celebration at the National Shrine of the Divine Mercy in Stockbridge, Massachusetts, where about 20,000 people are expected to visit for Divine Mercy Sunday, said Marian Father Anthony Gramlich, shrine rector. Mass is televised live, but even the cameras can’t capture the sea of people from all over the world who come to share the experience. It takes about seven months to plan Divine Mercy Sunday and another month for wrapup, Father Gramlich said. A team of 600 volunteers helps coordinate the event, which also includes a whole medical team. Divine Mercy Sunday is an outdoors event at the shrine, which can be tricky in western Massachusetts, even in the spring. One year, five inches of snow fell and there were still 175 buses filled with pilgrims, Father Gramlich said. By comparison, Divine Mercy Sunday is a more low-key celebration at Divine Mercy of Our Lord parish in Mesquite, Texas. The church plans a sung bilingual chaplet of divine mercy, followed by Stations of the Cross. The lack of a big celebration is intentional. More of the parish’s divine mercy celebrations are held during Lent, Foster said, including two-day conferences held in English and Spanish. The Spanish events are so popular they are held at the Mesquite Convention Center to be more accommodating. Whether it’s a massive event at the shrine or an intimate service in a small church, Divine Mercy Sunday offers an opportunity to strengthen our relationship with God. “We want people to have that mercy come into their lives and transform them and then for them to take the message and share it with others at home,” Father Gramlich said.